Backpacks, lunch boxes, and pencils kits are out on every store shelf, which can only mean it’s Back to School season! While kids are in school, they’re also being exposed to all different kinds of childhood illnesses. Although it’s normal for children to be sick a few times in the same school year, a few pointers can help you prevent illness, and know when to see a doctor. 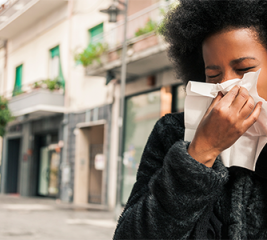 Colds – Colds are viral infections that can cause a runny nose, coughing, and a sore throat. They usually start gradually, have a low or no fever, and go away on their own. Your child can help prevent a cold by washing their hands regularly at school. Antibiotics do not help cure a cold. 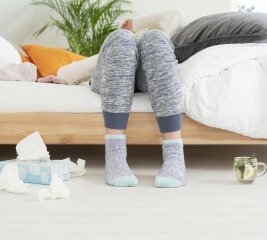 Flu (Influenza)– The flu is an infection with a particular type of virus that causes an illness similar to a cold, but tends to start suddenly with a higher fever, and leads to more body aches. Antibiotics also do not help cure the flu, but the flu shot and regular hand washing can help prevent the flu in the first place. It can be hard to tell the difference between colds and the flu, so speaking to a doctor in person or over a video can help you know. Pink Eye (Conjunctivitis)– Pink Eye is an infection that can be caused by either a virus or bacteria and causes very red eyes. It can spread very easily, so keep kids home if they have pink eye. As with other infections, having kids wash their hands regularly can help prevent pink eye. It can be difficult to tell if your child’s pink eye is bacteria or a virus, so going to a doctor in person or seeing a doctor through a video visit is important to make sure your child is getting the right care. Most common illnesses can be treated at home with rest and fluids like water or soup. However, it’s important that talk to a doctor if you’re worried about your child, if your child’s illness appears to change, becomes worse, does not go away after a few days, or if you are worried about any new symptoms that develop. Comments and opinions from Dr. Sylvia Romm are hers alone. This is content from an interview and is not considered medical treatment.